We’d love your help. Let us know what’s wrong with this preview of Huckleberry Christmas by Jennifer Beckstrand. A difficult marriage has left the Helmuths' widowed great-granddaughter, Beth, finished with wedlock. Sh Now that they've happily married off two of their grandchildren, Anna and Felty Helmuth are ready for their next matchmaking challenge. What better way to celebrate the most heartwarming of seasons--and make Huckleberry Hill, Wisconsin, the place for unexpected love. . .
To ask other readers questions about Huckleberry Christmas, please sign up. I have not received my Goodread giveaway copy of this book which site states I won. Has anyone received the book yet? Ann Valdez I got mine and finished it today. Wonderful book!!! I am so glad to have discovered the writing of Jennifer Beckstrand because reading one of her books is pure pleasure. In fact, I can hardly read without a smile on my face. This is the third novel of Jennifer's that I've read, and I find her writing very refreshing and enjoyable. Filled with charming characters, sweet romance, and gentle humor, Huckleberry Christmas captured my interest from the first page as I was transported to the Huckleberry Hill community of Bonduel, Wisconsin , and the ending left me looking forward to Anna Helmuth's next matchmaking effort. Although part of a series, it can easily stand alone. The Matchmakers of Huckleberry Hill is a delightful series about an elderly Amish couple who decide to meddle in the lives of their relatives in order to help them find suitable mates. Felty and Anna are at the heart of these stories, but much more than mere matchmaking, they have the unique ability to gently impart spiritual wisdom into the hearts of their loved ones, wisdom that comes from a lifetime of walking with God. Felty and Anna are two very memorable and beloved characters. Huckleberry Christmas shows a refreshingly different side of the traditional Amish setting - one infused with humor, where scarves are knit in bright colors contrary to the usual style, and where not every Amish woman is an excellent cook - Anna's green gelatin mixed with pickles and her runny rice pudding, for example. Jennifer's straightforward writing style and rich characterization are so easy to connect with. The serious theme of emotional abuse is also brought in and handled well. In one particular scene, Anna points out to Beth: "You shouldn't let Amos ruin the rest of your life. . . . Do you really want to give his memory that much power?" With his giving and caring nature, Tyler is one of my favorite heroes. Beth carried a lot of emotional baggage from her previous marriage, where she had lived with a constant criticism that eventually destroyed her trust in men and her faith in God. I love the advice Beth's mom gave to Tyler: "Beth won't jump into the pool until she's checked to make sure it's filled with water. Then she'll have to be certain the water's warm. And then she'll want to know there's a gute swimmer to catch her. You'll have to be patient." Spiritual themes flow throughout the narrative in a natural and beautiful way. One message that always speaks to me is the importance of trusting in God alone - because people, no matter how good or well intentioned they are, will invariably let us down. Also touching was when the words from O Little Town of Bethlehem - "How silently, how silently the wondrous gift is given" - caused Beth to reflect that "God's gifts were given so quietly that many people didn't even recognize blessings when they came." I hate to imagine how many times that has been true in my life. So often an author will rush a book's ending, but not so here! Jennifer took the time to give Huckleberry Christmas a delightfully satisfying ending which readers will enjoy and appreciate. I'm eager to see what Anna and Felty are up to in Huckleberry Spring, which releases in February 2015. Highly recommended to fans of Amish fiction. 5 stars based on the enjoyment factor. This is one of the better Amish Romance series out there, especially if you are not interested in books that preach to you. This series contains just the perfect blending of humor, romance, religion and deep feelings for your fellow man. I am a non-believer and I just love this series. I am never made to feel preached to but I do get a greater understanding of the bible the way the Amish understand it. This book follows the general recipe that the previous books have set up. We have the Helmuth's This is one of the better Amish Romance series out there, especially if you are not interested in books that preach to you. This series contains just the perfect blending of humor, romance, religion and deep feelings for your fellow man. I am a non-believer and I just love this series. I am never made to feel preached to but I do get a greater understanding of the bible the way the Amish understand it. This book follows the general recipe that the previous books have set up. We have the Helmuth's - wonderful, loving, elderly (not so you'd really notice though!) grandparents who are looking to marry off their grandchildren. They have some success. In the last book we meet Tyler Yoder who had been jilted by his intended and that is who Anna and Felty target this time. The Helmuth's cleverly (or just Anna I should say!) plan to get Tyler and their grand-daughter Beth, who is a widow with a very young son, together. Little did Anna know that her grand-daughter swore off marriage and this is where the fun begins. I think what I really like is that this isn't such an Old Order family, so some of their actions and even the way they talk is very understandable to even us 'Englisher's'. The character's are well fleshed out and you feel as if you are part of their family, enjoying and rejoicing with them and hurting with them and for them when they hurt. This is one of the sweetest Amish romances that you'll ever read. Anna Helmuth is quite the matchmaker and this time she's planning on getting her granddaughter, Beth hooked up with Tyler Yoder, who was jilted by his last choice of bride. Our hero and heroine are both a bit shy of marriage/love. Beth is out of an abusive relationship, not only with her departed husband, but also her inlaws. As you discover more and more about her husband Amos and his mom and brothers, you can't help but feel terr This is one of the sweetest Amish romances that you'll ever read. Anna Helmuth is quite the matchmaker and this time she's planning on getting her granddaughter, Beth hooked up with Tyler Yoder, who was jilted by his last choice of bride. Our hero and heroine are both a bit shy of marriage/love. Beth is out of an abusive relationship, not only with her departed husband, but also her inlaws. As you discover more and more about her husband Amos and his mom and brothers, you can't help but feel terribly sorry for her. Her son Toby, is the most precious thing. I loved how he calls people he loves "Mommy." Tyler is the best hero ever, as far as Amish romance is concerned. He is all kindness and goodness. Even though he doesn't expect to find love after his last relationship went awry, his feelings for Beth are there almost from the start. (Even when she's hitting him with sunflowers). When Beth refuses Tyler's proposal, she offers to find him a bride. Her matchmaking is hilarious, and almost as funny as the old Amish bachelors that come courting her. Vernon is an absolute hoot, and he doesn't seem to realize that there is someone else in her heart. This is an absolutely wonderful read for the holiday season and a great book for lovers of Amish romance. I wish there were more Anna's in the world!! Maybe there would be a lower divorce rate in the world. I totally understand Beth's reluctance to open her heart but I also know fear of repeating your "mistakes". Now that they've happily married off two of their grandchildren, Anna and Felty Helmuth are ready for their next matchmaking challenge. What better way to clelbrate the most heartwarming of seasons--and make Huckleberry Hill, Wisconsin, the place for unexpected love. . .
OH MY! I don't know how Jennifer does it but each book just gets better. This is a beautiful story along with the humor she includes, you even get to envision eating a couple of Anna's wonderful recipes like grated carrots and bite-sized slices of dill pickles floating in a murky sea of green gelatin or rice pudding that tastes like warm milk and sugar, with occasional lumps of rice and cranberries for texture, lol. I very highly recommend this book, this series! I am so looking forward to book four already, Huckleberry Spring, and number five, Huckleberry Harvest. The problem is I have to wait until February 2, 2015 and May 26, 2015, that just isn't fair, lol! I just finished reading Huckleberry Christmas. I can only say 5 stars. It was so good. It was fun, entertaining and just plain enjoyable! This book has the lovable Anna and Felty Helmuth back to their match-making antics. This time it's for their recently widowed granddaughter, Beth. Beth has a young son, Toby and lots of hard to deal with memories of a very difficult marriage. So hard that thoughts of another marriage are the last things on her mind. Anna has plans for Beth and Tyler Yoder. But I just finished reading Huckleberry Christmas. I can only say 5 stars. It was so good. It was fun, entertaining and just plain enjoyable! Anna has plans for Beth and Tyler Yoder. But those plans are not Beth's as she tries to arrange dates for Tyler, thinking she may have gotten a good match with Erla Glick. But is this what she really wants? Her deceased husband's brother, Isaac, is also after her heart, feeling that she has responsibilities to their family, especially since her mother-in-law is very ill. Beth does go to their home to help and Isaac tries to claim Beth as his fiance. There are lots of fun twists and turns in this book. Now this is entirely an aside from what I have written. I am a German and we eat "Bratwurst", commonly called "Brats". I have a brother-in-law who lives in Wisconsin, in fact, close to Bonduel. He is always talking about Brat buns. Well, I tell him Germans do not eat Brats on a bun. It just isn't done...he says in Wisconsin they have special buns for them. This is an ongoing laugh we have together. Well, it must be a "Wisconsin" thing, because Jennifer mentions Brat buns in her book which is set in Bonduel, Wisconsin. I had to laugh at this part. She really did her research! And then the line which Tyler states, "It's a crime to eat a Brat without one." So of course, this was a little private joke just for me! 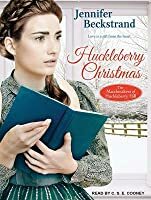 I have read two of Ms. Beckstrand's books and loved them, so I was eagerly awaiting the day when Huckleberry Christmas made it to the top of my to-be-read pile. I read Huckleberry Hill and Huckleberry Spring, and these were probably out of order. I was amused by them, Ms. Beckstrand is a humorous writer, and made me laugh. But this story fell flat. Beth was too angry, always lashing out, though I understand, she doesn't want to be married, blah blah, and everyone wants to marry her, so she's ang I have read two of Ms. Beckstrand's books and loved them, so I was eagerly awaiting the day when Huckleberry Christmas made it to the top of my to-be-read pile. I read Huckleberry Hill and Huckleberry Spring, and these were probably out of order. I was amused by them, Ms. Beckstrand is a humorous writer, and made me laugh. But this story fell flat. Beth was too angry, always lashing out, though I understand, she doesn't want to be married, blah blah, and everyone wants to marry her, so she's angry. Tyler was too apologetic. Always saying "I'm sorry." Over and over and over for the same thing until I wanted to smack him. That made me angry. Not only that but Beth willing took her son back to an emotionally/verbally abusive home. This story was not near the quality of the other two books I read and I was greatly disappointed by it. There are a lot of five star reviews so obviously most people disagree with me, but for me this was a huge miss. But don't take my word for it! You might be one of the many that loved it! There is some humor, but in my opinion, this was not Ms. Beckstrand's best. I received this book from www.paperbackswap.com and was not required to write a review. I have sent my copy on to the next person on this wish list and hope they enjoy it more than I did. Back for another wonderful visit with Annie and Felty Helmuth, and Amish country in Wisconsin. Annie is back at her matchmaking for her grandchildren, and next on the list is Beth, and Annie-bannanie has chosen a fellow we met in the last book Tyler Yoder. Now Beth has come to stay with her Grandparents, she is a young woman with a darling little boy. What we are about to find out was that she had been in an abusive marriage, and doesn’t plan to even put herself in that position ever again. She h Back for another wonderful visit with Annie and Felty Helmuth, and Amish country in Wisconsin. Annie is back at her matchmaking for her grandchildren, and next on the list is Beth, and Annie-bannanie has chosen a fellow we met in the last book Tyler Yoder. Now Beth has come to stay with her Grandparents, she is a young woman with a darling little boy. What we are about to find out was that she had been in an abusive marriage, and doesn’t plan to even put herself in that position ever again. She has been terrible hurt and needs a lot of healing and learning to trust God, not herself. Then we have Tyler, was he hurt when his girl ended up with the Helmets grandson? Will he be interested in Beth? You will be surprised at how his feeling develop. Had to love this fellow and how he kept himself, and how deeply he followed his faith. There are a few of Beth’s decisions that will make you cringe, and sometimes I felt like shaking her. I had to wonder if Beth would survive some of her former relatives. Come back again for a wonderful and joyful visit with the Helmut Grand/Great Grandparents, sure would love to have them for mine. Throughout the story I felt God’s hand there and leading them to end up at the right spot at the right time. What a great story of Faith, and how it is shared in this community. I can’t wait for the next book in this series, and there is a little tease offered! Jennifer is an amazing author! Is it possible that this one is even better than the previous two! I keep reading comments from my readers who are telling me that Huckleberry Christmas is their favorite book in this series… so I have to consider this. I don’t know… Huckleberry Hill was my favorite… until Huckleberry Summer came out and I read it… then it was my favorite — I loved it when Lily called Aden’s dog Piecrust! Okay, on to the characters from Huckleberry Christmas! OK, no more hints or clues… but let me assure you that you’ll love this sequel; it’s absolutely wonderful! What a joyful book, as Mammi Anna sets in for her latest matchmaking schemes. Beth a widow, who was married to an emotionally abusive man, is now determined to make a life for herself and her little redheaded cutie son Toby on her own. She doesn't want to take a chance on love again. Tyler is in love with her, he makes bacon pancakes for her and purposes, but she turns him down but offers to help him find a good wife. I laughed my way through this book as Beth learns to trust God and to love aga What a joyful book, as Mammi Anna sets in for her latest matchmaking schemes. Beth a widow, who was married to an emotionally abusive man, is now determined to make a life for herself and her little redheaded cutie son Toby on her own. She doesn't want to take a chance on love again. Tyler is in love with her, he makes bacon pancakes for her and purposes, but she turns him down but offers to help him find a good wife. I laughed my way through this book as Beth learns to trust God and to love again. Mammi Anna and Dawdi Felty are grandparents that everyone would love to have. I could almost hear Felty singing as I turned the pages of this book and had the feeling that I was also there on Huckleberry Hill. I received a free copy of this book from Kensington Books and Net Gallery in exchange for my honest review rather it be good or bad. Thank you. What a marvelous Christmas book! Jennifer Beckstrand has written a clean, joyous, easy-to-read Christmas novel. The storyline is well-written, detailed, plus has great humor. I loved all the characters with their unique personalities. Descriptions in Huckleberry Christmas are so vivid, I could envision them in my mind. 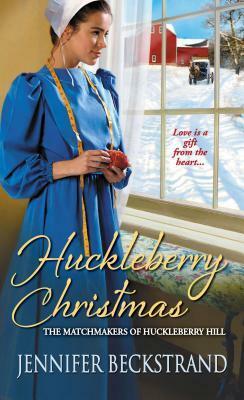 I truly enjoyed reading this book and Huckleberry Christmas is a book you will want to put on your reading list. I received a complimentary copy from the publisher through NetGalle What a marvelous Christmas book! Jennifer Beckstrand has written a clean, joyous, easy-to-read Christmas novel. The storyline is well-written, detailed, plus has great humor. I loved all the characters with their unique personalities. Descriptions in Huckleberry Christmas are so vivid, I could envision them in my mind. I truly enjoyed reading this book and Huckleberry Christmas is a book you will want to put on your reading list. Goodreads win. Will read and review once recieved. This is the second free book from Goodreads, it is to be released in October so I won't give the plot away, but I guarantee you will love it like the rest of the Huckleberry series. After a failed courtship, Tyler thought the best he could hope for in a wife was mere comp A difficult marriage has left the Helmuths' widowed great-granddaughter, Beth, finished with wedlock. She's content to live with them and make a life for herself and her toddler son. But once she turns down handsome Tyler Yoder's proposal, it seems only fair to encourage him to find a suitable wife. Trouble is, his gentleness and generous ways are showing her how joyous a real meeting of hearts can be. . .
heavenly Father. She had many interested in marry Great story. It was a nice, clean romance and I enjoyed it. I have never read an Amish romance before and probably wouldn't have read this one but it came free with the new romance program on Audible. I liked it, but am not really sold on the Amish genre. Beyond the motif, I liked the main characters and felt the psychology and story worked pretty well. Not sure I'd read another Amish story if other options were available, but it wasn't bad. This is the third in the series and I thought it was the second - oops. But it doesn’t seem to be a big deal to read them out of order. They are fine - so far - as stand alone books. It was another cute Amish romance. This involved the young widow Beth and her toddler Toby, and her hesitant relationship with Tyler, a really really sweet guy. Although this is an Amish story, it is not the typical predictable Amish story. It is full of good humor and twists that make it interesting. The other thing I liked is that it wasn’t too Christmas-y. I read it in May and it didn’t feel out of season. I will look forward to reading more in the series! Love the way this story went. The lesson that Beth learned is great - she had to learn to trust the Lord and realize that He is with her and all things work out if you trust the Lord. I love the way Tyler never gave up on her. It sure was a feel good story. This was a nice clean romance, between a young widow, with a young son, and an Amish man, who is determined to win over this woman, who doesn't want to have anything to do with marriage, ever again. Her husband was abusive, and his mother was verbally abusive, and was the husband's brother. A wonderful book and series. Wonderfully funny and heartwarming characters with a great story of family, love and most importantly God! Couldn’t put it down! I've only read a couple books in this series but so far find them very enjoyable! I got so much joy reading this book: I got a laugh out of the two characters lol. What a wonderful cute book o read. I love that the author deals with abuse in such a manner. I love this series. The Honeybee Sisters, has created a lot of romantic buzz. Sweet as Honey received a starred review from Publisher’s Weekly and Sweet as Honey and A Bee in her Bonnet were both awarded Top Picks from RT Book Reviews.